There are 44 rivers in Kerala, and 42 dams and reservoirs. The dams and reservoirs in Kerala include Solaiyar Dam, Kakkayam Dam, Idamalayar Dam, Peringalkuthu Dam and Kakki Reservoir. 14. Kallada River Thenmala Dam 25.90 Kollam 09° 57' 77° 4'20"
18. Kuttiady River Kuttiady Dam 10.52 Kozhikode 11° 36' 75° 49'27"
^ "Head works (Dam, Barrage, Weir, Anicut) in India". Government of India. Retrieved 9 October 2015. 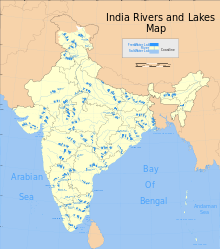 ^ "National register of dams in India" (PDF). Government of India. Retrieved July 9, 2015. ^ "Dams & barrages location map in India". Retrieved 2012-12-14. ^ "Gujarat: Disaster Management Plan: Operation of gates and rule curve levels for Irrigation Projects" (PDF). Narmada, Water Resources, Water Supply and Kalpsar Department. ^ "Almatti Dam". India-WRIS. Retrieved 27 July 2016. ^ "Almatti Dam". Krishna Bhagya Jala Nigam Limited. Retrieved 27 July 2016. ^ "Basava Sagara (Narayanapur Dam)". India-WRIS. Retrieved 27 July 2016. ^ "Basava Sagara (Narayanapur Dam)". Krishna Bhagya Jala Nigam Limited. Retrieved 27 July 2016. ^ "Bhadra Dam". India-WRIS. Retrieved 27 July 2016. ^ "Bhadhra Reservoir Project". KARNATAKA WATER RESOURCES DEPARTMENT. Retrieved 27 July 2016. ^ "Tungabhadra Dam". India-WRIS. Retrieved 27 July 2016. ^ "Krishnarajasagar Dam". India-WRIS. Retrieved 27 July 2016. ^ "Linganamakki Dam". India-WRIS. Retrieved 27 July 2016. ^ "Harangi Dam". India-WRIS. Retrieved 27 July 2016. ^ "Ghataprabha Dam". waterresources.kar.nic.in. Retrieved 27 July 2016. ^ "Malaprabha Dam". waterresources.kar.nic.in. Retrieved 27 July 2016. ^ "Kadra Dam". India-WRIS/. Retrieved 27 July 2016. ^ "Supa Dam". India-WRIS/. Retrieved 15 October 2016. ^ "Kanva Dam". India-WRIS/. Retrieved 15 October 2016. ^ "Kodasalli Dam". India-WRIS/. Retrieved 15 October 2016. ^ "Vani Vilasa Sagara Dam". India-WRIS/. Retrieved 21 October 2016. This page was last edited on 10 April 2019, at 13:01 (UTC).